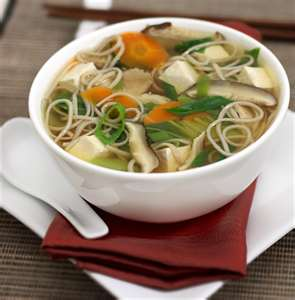 It's aclassic chinese soup, you can add boiled chicken in it for variation. 50 gm Cabbage,cut into thin strips. 50 gm Capsicum, cut into thin strips. Heat the oil in a wok, then add chopped ginger-garlic and green chilli ,after that add onion and saute for few seconds. Add the vegetables and cook for a few minutes. Add Ajinomoto, soya sauce, chilli sauce, and stir in cornfour slurry. As the cornflour thickens, add water and salt, and allow it cook. At the end, add a teaspoon or two, of vinegar and add sugar. Take a few noodles and coat them into cornflour powder, then deep fry. Serve hot and add fried, crunchy noodles at top. do we need to fry the boiled noodles?